Porsche Great Britain has just put the finishing touches to a very special car that will feature as part of the marque’s celebrations at the 2013 Goodwood Festival of Speed. 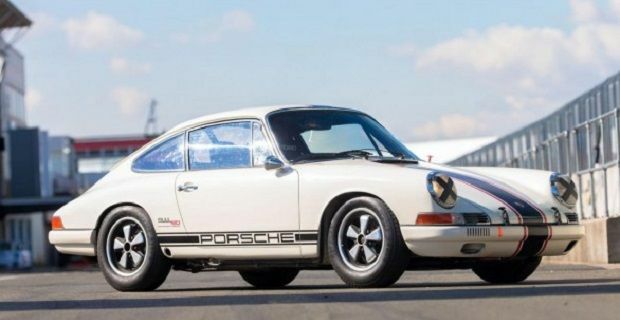 The project has been named Project 50 as the restored 911 is part of the German brand’s yearlong celebration of their iconic sports car 50th anniversary. In Britain the main focus of the celebration will be the car taking centre stage at the Goodwood Festival of Speed, which begins on 11th July. The Porsche technicians haven’t just altered the car’s looks to bring it into the 21st century they’ve thoroughly reworked the whole car. The completely restored 911 was originally built in 1965 as a short wheelbase machine. It was part of a batch of 6,606 other 911s that rolled off the production line between 1964 and 1968. It originally cost £3,438 when it was sold to an Italian driver in 1965. After that it changed hands several times over the years ending up in America until the 1990s when it was converted to meet FIA racing specifications. Porsche acquired it in the 1990s when they completed an initial restoration of the 130 hp sports car. It was then sent to Porsche GB for the Project 50 restoration. Once it has debuted at Goodwood, the Project 50 will be raced in selected Masters Series historic racing events where special guest drivers like Richard Attwood and Barry Home will put it through its paces. This car is a stark reminder of how far the 911 has come over the past five decades. When it’s parked on Lord March’s lawn in July, guests of the Goodwood Festival of Speed will be reminded of the car’s glorious past in a much more natural way than the planned central monument outside Goodwood House ever could.